Making prawns pickle had been on my ‘to cook’ list for so long, finally I struck it off. I literally did a happy dance after making this pickle and a crazy dance after tasting the pickle. It turned out awesome and yes better than the store bought ones. I don’t think there will be even a single Keralite (who is a non-veg) who can resist this pickle. It’s a true Kerala delicacy. In India, we make pickles with different kinds of ingredients; with raw mango, lemon, gooseberry, mixed veggies, grapes, green chilies, fish etc etc. My most favourite pickles are prawns pickle and king fish pickle. 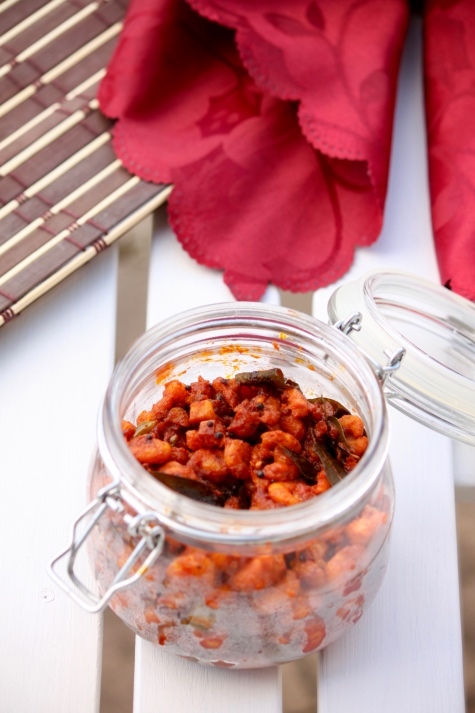 Prawns pickle is a Kerala speciality pickle as prawns are abundantly found in Kerala. 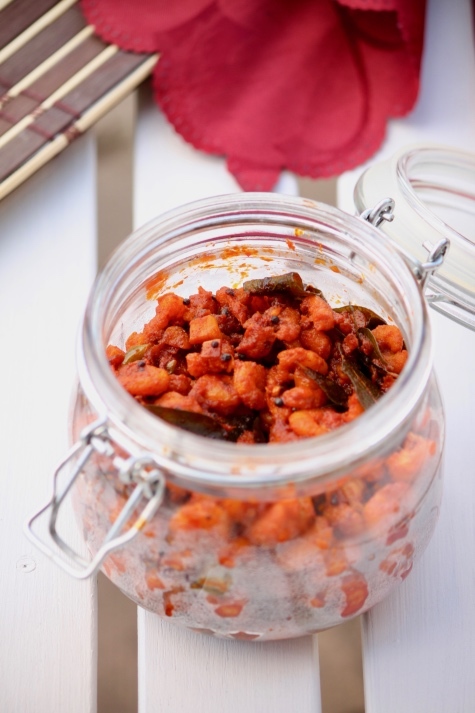 My mom used to make prawn and king fish pickle often and they never lasted more than a day- well, pickles are supposed to last for a few weeks. It’s so addictive that you cannot stop eating it and you feel content after finishing it up. My sis, dad and I used to take turns and cleaned up the jar in just a few hours and the angry look on my mom’s face- how I miss those days, feeling nostalgic. This can be served as a side dish along with rice and with literally any of the Indian meals. If you cannot find fresh prawns, get the frozen ones or even the cooked frozen prawns can be used for making this pickle. 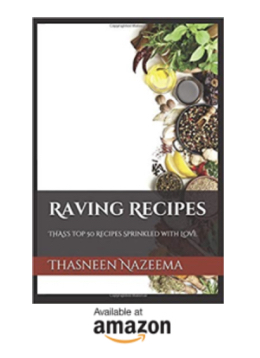 Give it a try, I can vouch that this will turn into your favourite recipe and you will make this quite often. Enjoy! Use small prawns, either fresh or frozen ones. If frozen, thaw them well before marinating. You could also use cooked frozen prawns. In a bowl, combine the prawns along with chili powder, turmeric powder, ground pepper and salt. Marinate for 15 minutes. Place a frying pan over medium heat, add oil enough for frying. Shallow or deep fry the prawns in 2 batches. Transfer the fried prawns onto a kitchen paper towel. Keep aside. In the same frying pan, use the leftover oil from frying prawns and add 3 tbsp gingellly oil or coconut or vegetable oil. Add the mustard seeds, let splutter. Add fenugreek seeds, saute for 3 seconds. Do not burn the seeds. Add ginger, garlic, green chilies and curry leaves; saute for a few minutes till they turn golden. Add Kashmiri chili powder, combine well. Add white vinegar, combine well and cook for 2 minutes. Add the fried prawns, combine well and stir fry for 2 minutes. Remove the pan from the heat, keep covered and let it cool down. After it has cooled down, store in an air tight container. Allow it to rest for a day, pickle will be set well and tastes better the next day.